"I ALWAYS eat my vegetables!" A Carroboscis is a carrot-like creature that can hover in the air. Their name is a portmanteau of carrot and proboscis, likely referring to their long pointed noses. These enemies reside in Booster Pass, the entryway to Booster Tower. Although fairly strong, Carroboscis only aid other enemies, such as the Spikester, in battle; Carroboscis never fight on their own or with their own kind. In a fight, a Carroboscis will jump towards the opponent and flash its green eyes, causing damage. A Carroboscis can also summon magical bells to attack intruders with musical spells while using Doom Reverb, Spore Chimes, and S'crow Bell. These musical magic techniques will cause adverse status ailments, including the Silence, Scarecrow, and Mushroom status impairments. 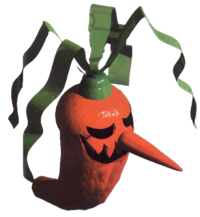 White versions of Carroboscis, named Radish (left), were originally going to appear in Super Mario RPG: Legend of the Seven Stars, but were cut from the game. They also had the same health points as Carroboscis, with the exception of lacking magic attacks. This page was last edited on October 13, 2018, at 00:37.